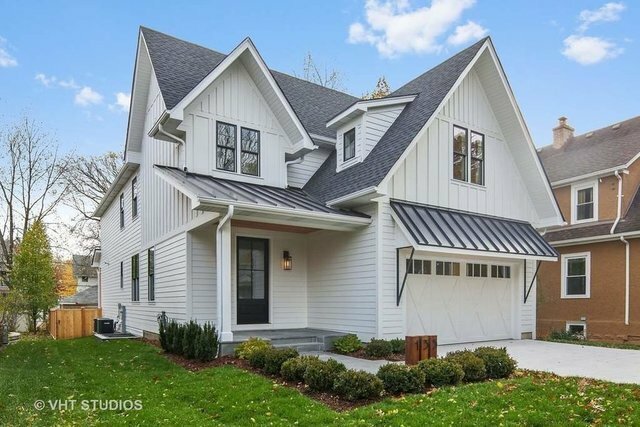 New construction designed by TE McKenna Builders one block from town; new plan new look!3,756 square feet,10-foot ceilings on first floor, huge inviting foyer with built-in bench, first floor private office, formal dining. Custom gourmet kitchen with a 9-foot island, breakfast bumpout with custom built wood bench, walk-in pantry, custom wine bar with sink and wine fridge. Huge family room with fireplace.Master suite with 15-foot vaulted ceiling luxury spa master bath four spacious bedrooms, 4.1 luxury baths. Second floor laundry, custom mud room.Finished basement (10-foot ceilings), exercise room, play room, rec room, second bar area with future wine closet. Whites-grays moldings trim, custom quality.Walk to town, train, schools, parks, shops, restaurants, everything!